One of the world’s most successful English School franchises, Direct English, opened officially in Bulgaria this month bringing its highly effective teaching methods to adults wanting to learn English. It also brings exciting business opportunities to other schools wishing to expand the successful franchise across the country. 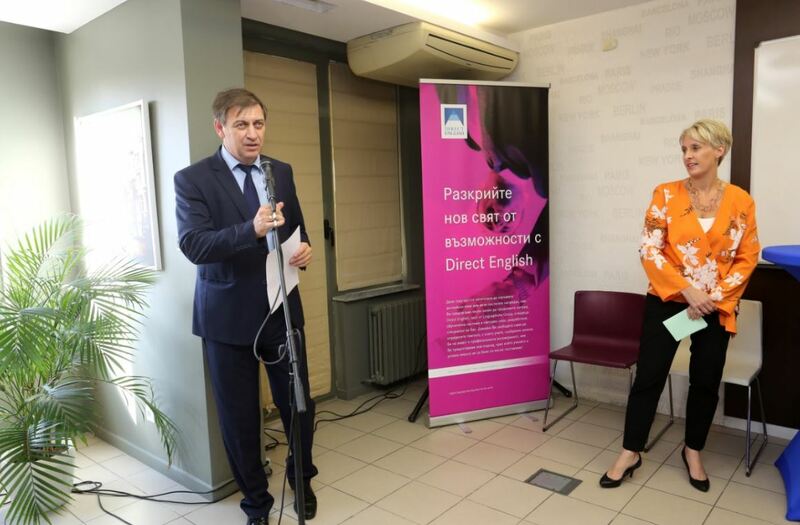 Direct English Master Licensee, Jordan Andonov, hosted a grand event attended by the Ambassador of the British Embassy in Bulgaria, her Excellency Emma Hopkins, Ministries of Parliament, and senior executives from schools and the private sector. Direct English is a world-leading training system from UK-based Linguaphone Group. It is designed around the student, moving at their own pace and fitting around their work and lifestyle to make it easier for them to learn English. Business Development at the Linguaphone Group, Ms. Lucy Mills, went on to say that Direct English has a vital role to play in introducing adults of all ages to an essential life skill in a proven and accessible way. Direct English school Bulgaria has been integrated within the Alexander Training Center, which already has more than fifteen years’ experience in the Bulgarian market, delivering language training to adults across the country. It was established to provide language training and other educational services to children, students, and adults. In addition to English language tuition, it also teaches other languages such as German, Spanish, Italian, Greek, and French. Summarising Direct English’s winning points of difference, Jordan Andonov said that “it offers a training which is different from the traditional idea of the language course. The ability to select where, when and how fast and quickly you would like to be trained is an approach that has proven successful for busy people. We know that each person is unique and has its own way of studying, which is why we are delighted to teach courses adapted to individual needs. Developed in 1997 by the internationally renowned education authority Louis Alexander, Direct English is a premium learning system taught using the global standard American English. With the heritage of the UK-based Linguaphone Group, a world-leading language training provider with over 115 years experience in over 30 countries, Direct English has a global agreement with Cambridge English Language Assessment which allows its Master Licensees to apply to be authorised Cambridge English Language Assessment partners and offer learners a Cambridge qualification and certification. Across the globe the Group already have a strong franchise network successfully delivering the English training program. With over 2 billion people currently learning English to become part of the global conversation, English language education is a fast growing industry, with a global estimated revenue of over $50 billion. Students at all Direct English training centers will be able to get a formal and independent assessment of how their English language learning has progressed, thanks to a global agreement between the Linguaphone Group and Cambridge English Language Assessment. Under these arrangements, Direct English students can take the renowned BULATS test from Cambridge English Language Assessment, one of the largest testing organisations in the world. All students completing this test will receive a certificate from Cambridge English Language Assessment.